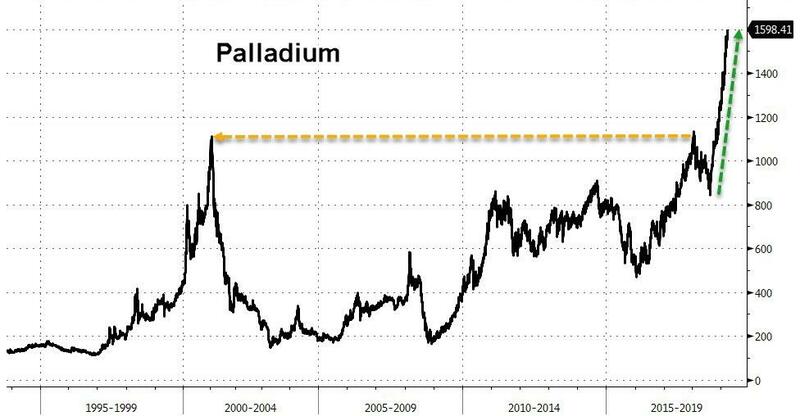 Palladium soared to a new record high over $1600 an ounce overnight, up 27% year-to-date, as global supply concerns dominate slumping-auto-demand fears. Even as auto sales in key markets slow around the world, Bloomberg reports that demand for the metal - mainly used in auto catalytic-converters in gasoline vehicles - has remained robust as manufacturers scramble to get hold of palladium to meet more stringent emissions controls, particularly in China. “Though there are concerns that auto sales are falling, the supply deficit problem is offsetting it,” said Ajay Kedia, director at Kedia Commodities in Mumbai, adding the market is highly overbought. “We remain bullish on palladium since the physical palladium market remains tight and it will take years to substitute,” analysts at Citigroup Inc. wrote in a March 19 report. However, it is the supply-side of the equation that warrants more geopolitically-relevant analysis as Reuters reports that Russia is mulling a ban on the export of precious metals scrap and tailings to promote domestic refining of the materials. “The market is in uncharted territory and on the fundamental side the ban from Russia has supported the prices,” Kedia added. More than 80% of palladium comes as a byproduct from nickel mining in Russia and platinum mining in South Africa, so supplies depend on the extraction level in other minerals, and more specifically, Russia was responsible for around 21% of total palladium exports in 2017 by value. “We’ve had three different sets of parking lots hit, and they usually get four or five vehicles each time,” police Lt. Chuck Nagle in Vestavia Hills, Ala., told the WSJ. So with Putin cornering the palladium market (a precious metal 30 times more rare than gold), sending the price explosively higher, one wonders just what would happen if China chokes up supply of the rare earth metals that are so critical to much of America's military-industrial complex? 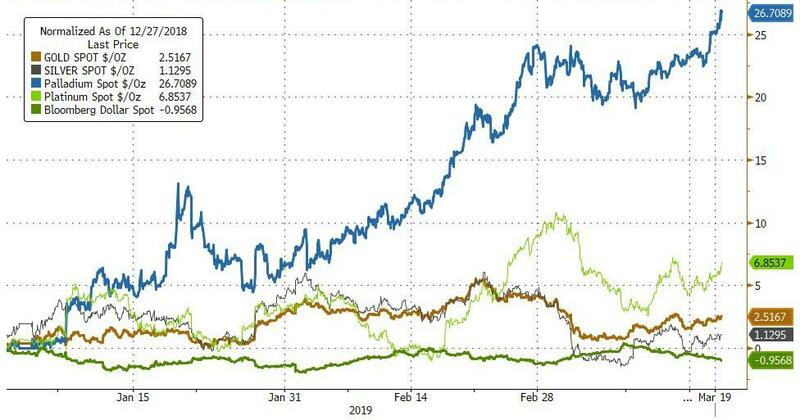 As an addendum (h/t ssiiuu), we were reminded that the biggest miner of palladium/platinum in Russia is NorNickel, of which none other than Oleg Deripaska's Rusal owns 25%. One wonders if this squeeze, as Deripaska is painted as the poster-boy for the Trump-Putin collusion-delusion, is a little payback for Washington - crushing US automaker margins even more.